Now I've passed the two-hundred recipe mark, I'm becoming increasingly aware that the remaining time on this challenge is becoming limited. In one way, I'm relieved because it means that I'll no longer have to face the 'Thursday Night Wall' like I did yesterday when I've put in a 12 hour work day; I've nothing in the cupboard to use for a quick, new recipe; and I've still got to write a vaguely entertaining blog after all of it. On the flipside, however, I'm a little bit sad that I won't have anything to coerce me into stepping outside my comfort zone every now and again. Nor an excuse to regularly bake cakes. Something my ever expanding bottom and thighs will most definitely thank me for! I really hope I don't return to my rut of non-adventure. Or to use the husband's favourite phrase 'Knowing what I like, and liking what I know'. I've still got to think how I will take my blogging forward after that date and I like to think that I'll blog less often but may actually try to come up with my own recipes instead of using other people's. In the meantime, I'm still enjoying learning about how recipes are created and flavours are balanced, safe in the comfort zone of someone else's instructions. And there's no safer pair of hands to be in when it comes to baking than Mr Lepard's. Why the rye bread? I'm not sure. I just knew I wanted to bake bread this weekend and bake something different. 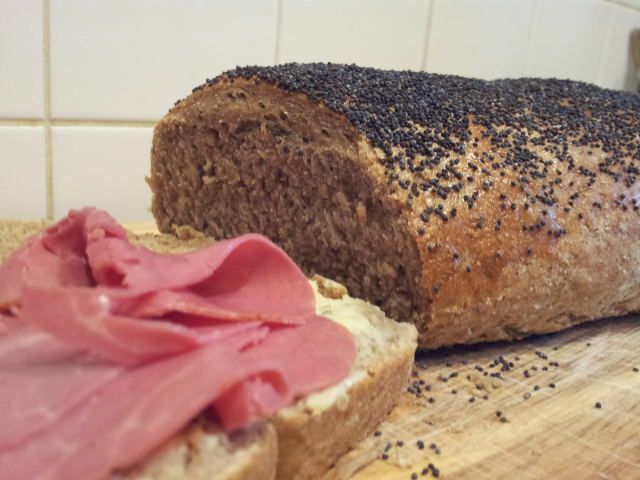 The Ocado man has bought me some pastrami and so I figured that it would be a good time to try my hand rye bread as I've never eaten it before. And I have a huge bag of rye flour sat in my cupboard from when I tried the Extra Thin Rye Crisp Bread recipe the other day. 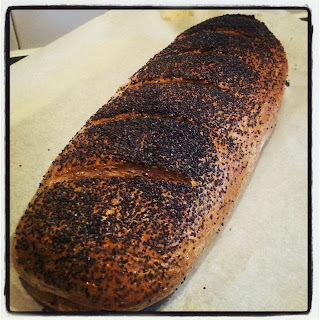 And some poppy seeds left over from Dan's Lemon and Poppy Seed cake. Plus the idea of baking is appealing and I'm (dare I say it) sick of cake for the time being. If I never see another one until at least Tuesday afternoon (when I have to bake a banana cake for a gift) then it will be too soon. I was also intrigued that the starter is made using coffee. Coffee in bread? That's a new one on me. I know that during the war, people used to scrape burnt bits of toast and use them in boiling hot water to make fake coffee, but I've never heard of coffee being put into bread. Cake, yes. Bread? There's a first time for everything. As I was being thrifty the other day and bought a tin of dried active yeast rather than the more sachets of instant yeast, I had to adapt the recipe slightly but it still worked out well. I used 90ml of water and a pinch of sugar to activate the yeast, so consequently reduced the amount of coffee I put in to 235ml. To keep the balance though, I made my coffee specifically for the recipe and used the same quantity of coffee as if I'd used the full amount of water if that makes sense? The starter looked and smelled rather disgusting. Coffee flavoured warm weetabix anyone. But knowing how well Lepard's recipes turn out, I wasn't unduly worried. The dough came together just as described, it rolled perfectly, took the slashes well (I think this is because the dough was quite dense), and looked just like the one in the picture when it was baked. So much so that the husband thought I'd bought it. The loaf was much lighter than I would've expected from rye breads I've seen in shops, but I assume that's because it's roughly two-thirds strong white flour to one third rye. Surprisingly, you couldn't taste the distinct coffee flavour at all. I liked the bread and would make it again once in a while when I felt the need to eat 'healthy-looking' bread. But not as a general every day bread - I'm still such a sucker for home made white bread even though I know it's bad for me. Next on the bread baking list - either Dan's sour cream loaf or trying to make a decent half white, half brown sandwich loaf. Or both. And Dan's English muffins. 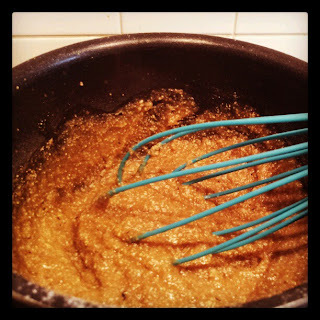 You can find the recipe in Short and Sweet and online here. The black pepper rye is a really lovely bread isn't it - I'm not a coffee fan at all, but really enjoy the flavour of this bread. I'd definitely recommend making the sour cream bread next - one of the best white breads I've ever made and I know a few people who feel similarly. It's spectacular!